A whole lotta Jazmine love and wisdom for this Sunday! I don’t have the time for it, nor do I need another hobby, but sometimes I wish I could take professional quality photos with a professional camera. This image is of my lovely Jazmine that I took with my iPhone that would have been particularly stunning with the right camera. She’s been hanging out with me a lot lately – this is her on the shelf above my computer and I was able to capture her fawning down on me. She’s quite the flirt when she does that – she makes biscuits into the air while purring a love song and it’s about one of the most heart-melting things on this earth. 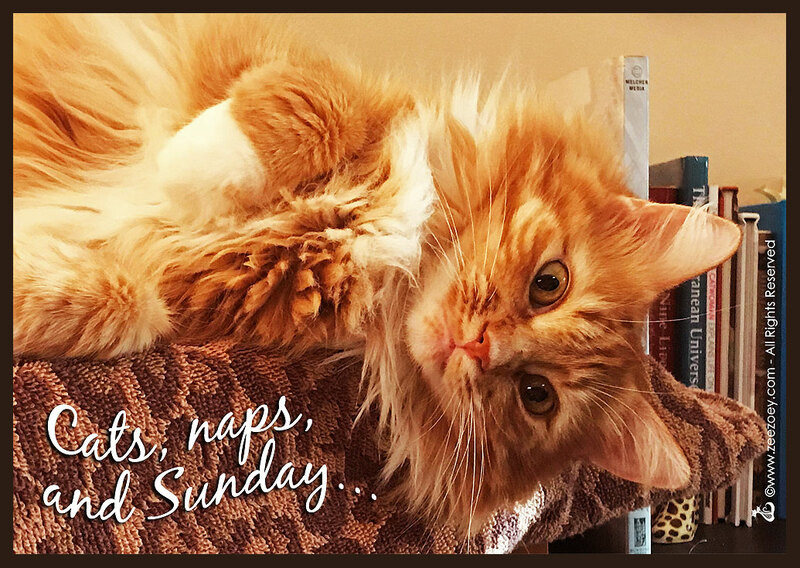 As always, she serves as a wonderful reminder for Sunday to relax, enjoy your cats, and maybe even take a nap! I know Jazmine will be doing that for sure! I have a nice DSLR but t is never as handy as my phone. Often, by the time I run into the bedroom to get the camera, the moment is gone. It is a lovely photo of beautiful Jazmine and her rich colouring. Oh bless, there surely is nothing finer than that which you describe, in one spot or another, no matter the time. I hopes that maybe using the Mac software will help change that photo, improve it somewhat for you. I have had great fun using mine to get the last few weeks photos. I hope you can get the camera soon. This is a great shot, but I’m guessing if you had the equipment you’d have an even better shot. Great photo I think. By the time you find your fancy camera, the cat has left the room! A lot of people think the iPhone takes great pictures. I’m one of them. Jazmine is gorgeous! and no other camera is needed to capture her beauty IMHO. I am a great advocate for the Smartphone as a camera and movie maker. Many ‘phones do epic work and got us to the Nose to Nose awards twice. So we think your picture is totally purrrfect! Honestly, we think that photo is pretty good! i need a new camera, my phone actually takes better pictures than my camera and I am so used to using it I don’t I will ever bother with buying a camera. The only time I use my camera now is when I want a picture of something that is a good distance away. Any photo of this little Squeedunk is adorable. She’s just precious. Z-Girl spent Sunday hanging out with us and we loved it! Thanks for the reminder to the humans to take it easy and marvel at the wonder of us cats! Hope you had an easy Sunday!